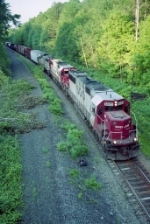 Description: CP was one of the few roads that bought the SD 90, and it was really uncommon for one to turn up in Binghamton. Eventually, everything gets here, and the SD 90 was no exception. This one is leading 166 as it waits for permission into the yard at BD. Description: CP 421 was the train that ran to Buffalo the days 167 didnt run. Todays version has three SOO SD60s not that unusual at the time. Here they split the signals at MP 228 in Campville. Note the traffic light signal on track 2. This was installed in preparation for single tracking the line, which NS would not accomplish for almost another 10 years. Description: Some red visitors on trash train K-276. 35mm print. Description: CSX K276 has a AC6000, 2 SOO's SD-40-2 and SD60 and a CP SD-40-2! Rare visitors for these parts! Description: I don't remember how it went down, but I discovered this lashup on the EDMO while at Eagle Bridge, so naturally I changed gears. The old diapadated B&M station is the building on the left. Description: Not sure why I skipped directly ahead to Reynolds, but the train may have been going pretty fast. Description: Yup, all this grass was a rail yard. A huge one. Good job, Guilford, and goodbye EDMO. I have run out of time, and light. Description: The Soo rock job crosses over old highway 8 in New Brighton. I believe that the lead SD60 is the 6037, not 100% sure though. Description: A late running 413 gets out of Binghamton in the midday hours behind a mix of CP power. Description: This 413 is heading toward the north end crossovers and an exit in this long lens view, bringing in the yard and the CP sign, the second or third on CP has had here. 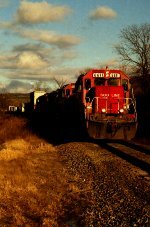 Description: Train 252 rolls downhill toward Binghamton behind a quartet of SD's led by red and white SOO 6611 under a wintry Kodachrome sky. Description: A slightly wider angle on 252 shows the full set of its power as it rolls by Fuller Rd in the late afternoon low light. Description: CP Eastbound Freight Train passing through Midland Jct., Mn. Description: The Dresser Turn comes into New Brighton at 7 AM . Description: An old relic of a sign captured here as the SOO Dresser Turn throttles up over the MNNR diamond. Description: Leaving the WC depot behind as the train heads to Humboldt yard. Description: The SOO-BN transfer comes into Northtown with a pair of SD60s. The 6032 trails.